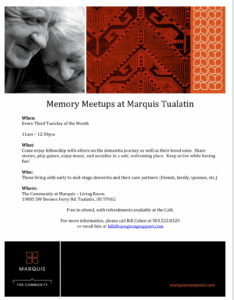 New Memory Meetups at Marquis Tualatin! On every 3rd Tuesday of the month, ‪‪from 11 am – ‬12:30 pm‬. Come enjoy fellowship with others on the dementia journey as well as their loved ones. Share stories, play games, enjoy music, and socialize in a safe, welcoming place with other people in the area who have been affected by memory loss. Keep active while having fun! This is for those living with early-to-mid-stage dementia and their care partners. In the The Community at Marquis’ Café Living Room. Free to attend, with refreshments available at the Café.